Today, a big part of the world’s population can’t imagine living their lives without smartphones and devices. Mobile gadgets are everywhere, and they are making our existence much easier. Smart-home automation is conquering the planet, helping us save time, money, and, most importantly, energy. Many of the top manufacturers are now making wifi air purifiers, so are they worthwhile or just another gimmick to sell you new tech you don’t need? Are they really worth buying? 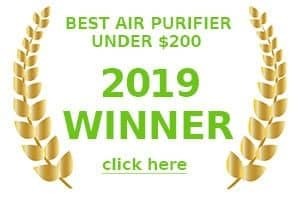 Let’s find out in my free guide below, where after extensive research, I’ll also give you my top 3 picks for the best wifi air purifier of 2019 award. A smart air purifier has all the properties of a regular unit. However, it offers the user a wonderful cherry on top. You can remotely control the purifier by using a smartphone app as long as you have internet access at home and on the go. Besides allowing you to adjust the fan settings, turn the air purifier on and off, and change the operation modes, you can check out important data. Smart air purifiers can give you information on the air quality no matter how far away from home you are. For example, if you are planning to come home from a business trip, you can use your smartphone to turn the air purifier on several hours before your return. This way you can be sure you’ll come home to a fresh and contaminant-free environment. A Wi-Fi smart enabled air purifier is a step into the future. The advantages of buying such a purifier are numerous. Most of the respected manufacturers are getting on the bandwagon and producing smart purifiers for customers with different budgets. Energy Efficiency – This goes without saying. When you can control the working time of your air purifier, you spend much less money on the energy bills. When you leave for work, you can turn the air purifier off and switch it on when driving back home. This way you can avoid wasting energy when you are away from home without compromising the air quality. Remote Control – You don’t have to get off your favorite couch in order to change the fan setting or turn your purifier on or off. This is a wonderful option for lazy people like me, who want to have all the control options at their fingertips. 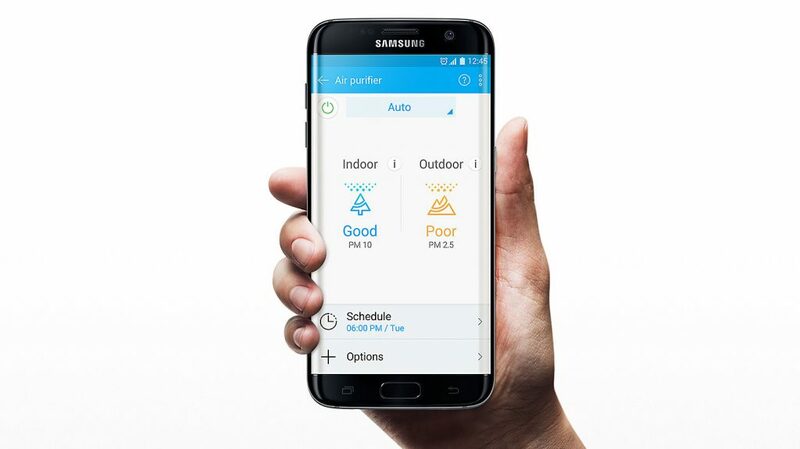 Additional Information/Insights – Smart purifier apps allow you to learn the air quality in your home at any minute. You can use this information to adjust the settings in time. You can also evaluate the work of the air purifier and see how fast it can clean your room. Some applications provide an operation report. At the end of the month, you can see how much energy your air purifier has been using and how often you needed to turn it on. This point is not something to be overlooked. Many of us have air purifiers at home, but are not so aware of just how much work they are being put through. You might find some key data in this extra analysis. Maybe the air quality in your home is particularly worse at certain times of the day or week? You can use this extra information to your advantage. Scheduling Options – Some smart air purifiers have a convenient scheduling option. You can choose the dates and times when you want your purifier to operate. This is especially convenient for people, who go on frequent business trips or vacations. Over time, you can create an ideal schedule for your air purifier so you never have to worry about turning it on and off again. Real-Time Alerts – The smart air purifier app can alert you about the quality of your air, the time for filter replacement, and many other things. The smart option allows you to forget about checking the air purifier performance. All the information is always available on your smartphone. Big Potential – As the technologies are marching forward, more and more new options appear for homeowners. By investing in a Wi-Fi enabled smart air purifier today, you may be giving yourself a chance to enjoy more advantages in the future. For example, smart thermostats can sense when the owner is driving toward the house and change the temperature accordingly. Most likely, smart air purifiers will use geofencing to adjust their schedules in the future as well. Smart air purifiers are bound to be more expensive than models without smart options. If you are slightly put off by the price, I recommend considering how much money you may save on the energy bills in the future. You might be better off buying a not so smart but well priced unit like a levoit instead. After looking though all the wifi air purifiers available in 2018, I decided to choose these three high-quality Wi-Fi- enabled smart air purifiers on the market. By reading these reviews, you can make a decision which one suits you best. 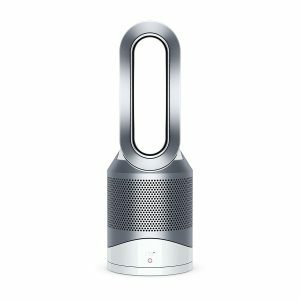 Dyson Pure Hot Cool Link Air Purifier – An air purifier fan! I chose this air purifier for its ability to keep the air clean while heating and cooling it. Essentially, it’s not just an air cleaner, it’s a fan with an air purifier. Something I get asked a lot is, do you know of any fans with air purifying capabilities? well , yes I do! This one…and I honestly can’t find many others. Bit of a gap in the market there i’d say. In hotter climates you really do need a fan, unless you can afford to run the air con 24/7 which can become extremely expensive. If you still suffer from allergies, having fans and air purifiers in your room can take up a lot of space. So, this unique air filter and fan from dyson can really help you to de-clutter. The dyson link comes with a HEPA filter and an activated carbon filter. The model has an excellent design. Even though it can’t clean a big room fast, it’s a great unit for individual use. The “link” in the name means that the air purifier can be linked to a smartphone app. This air purifier is equipped with a 360° glass HEPA filter, which takes care of 99.97% of contaminants 0.3 microns in diameter. This filter is ideal for cleaning the air around you unless you are suffering from tough air contamination, which comes due to heavy smoking or a big construction site nearby. The replacement filter costs about $60-70. The latest filter models are equipped with activated carbon granules, making the air purification much better. However, the filter price may go up to $99. The manufacturer recommends replacing the filter every 12 months. However, if you use the purifier on a regular basis (about 10 – 12 hours per day), I would strongly recommend replacing the filter in about 9 months. Otherwise, the purifier may not offer satisfactory results. The design of this air purifier is truly excellent. It’s a small unit, which you can easily carry around your home or office. The purifier weighs about 8 pounds. What you have to do is make sure it doesn’t become a tripping hazard by placing it on an elevated surface. You also have to leave sufficient space around the purifier for it to do its job properly. The purifier doesn’t have any controls on the body except the on and off button. This makes the unit look attractive. You can adjust the settings using the remote control and your smartphone app. A nice perk is the remote control’s ability to attach itself to the purifier’s surface magnetically. This way you are highly unlikely to lose it. The unit itself is equipped with a small screen, on which you can see the fan settings. It dims when the purifier is set to the sleep mode. This is a small air purifier so don’t expect it to clean your large room fast. It was initially designed to clean, heat, and cool the air in the user’s immediate vicinity. If you keep it running, over time, it will clean the air. However, you can’t count on it to replace a powerful air purifier in a large living room. The manufacturer doesn’t declare a certain coverage area for this unit. It doesn’t have a CADR rating either. Here comes the fun part. This small unit is stuffed with smart options, which make it very convenient to use. In order to take full advantage of the air purifier, you have to download an app to your smartphone and operate the unit from there. Night Mode – During the night, you can enable the mode, which dims the display light, and choose the lowest of 10 fan settings. Auto Mode – The air purifier has a sensor, which monitors the air quality and adjusts the fan speed accordingly. You can use your app to monitor the air quality from anywhere you wish. Voice Control – You can use Amazon Echo to control the air purifier with your voice. It’s as lazy as it gets! Scheduling – You can set up the operation schedule using your smartphone. It’s an advanced timer option, which allows you to choose when the purifier/heater/cooler will operate during the day. Modes – You can choose between focused or diffused modes depending on which area you would like the purifier to work on. Protection – The air purifier will stop working if you topple it over. The heating option will switch off if you run it for more than 9 hours in a row. This air purifier is highly energy efficient. If you don’t use the cooling and heating options, it can be called one of the most energy-efficient air purifiers I’ve reviewed. At the lowest setting, it uses only 5.5W. At the highest setting, the energy use is about 43W. This air purifier is fairly quiet. When you set the fan to level 1 or 2, the unit is barely audible and can easily be used in the bedroom. The highest fan setting is very noisy. It’s especially disturbing when you are sitting right next to the unit. However, the 10th fan setting is rarely necessary. During the day, you can use the 5th setting and get excellent results. This air purifier comes with a two-year manufacturer warranty. A 2-year warranty is a standard occurrence for air purifiers. However, I always recommend paying close attention to how you can get this warranty to work. Make sure you follow all the usage recommendations listed in the manual and change the filter at least once a year. You need to register the unit on the manufacturer’s website in order to get a full warranty. Overall, I would gladly recommend this unit to anyone, who is looking for a small air purifier with fan cooling and heating features. It does a good job cleaning the air around you while not producing too much noise and saving energy. If you are not put off by the price, this air purifier can become your favorite gadget at home and in the office and whilst dyson products are never cheap, this combination fan air purifier with heating ability can solve many problems, saving you from having to buy extra devices. 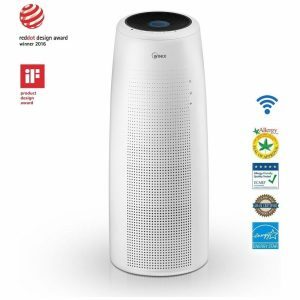 I chose this air purifier for its attractive tower design, reasonable coverage area (about 320 square feet), a variety of smart options, and a four-stage filtration system. This seems to be a powerful air purifier, with many interesting features, including remote operation via Wi-Fi. I appreciated the design of this Winix NK105. Truth be told, I like the tower air purifiers because they take up much less space than boxy models. They usually look futuristic and fit into virtually any décor. The control panel is equipped with just two buttons. On/off and mode. The rest can be adjusted with the app via Wi-Fi. The unit features a handle to make carrying it around easier. This air purifier can deal with a room up to 320 square feet. It’s AHAM verified. The CADR ratings confirm the manufacturer’s coverage area claim. The air purifier has a high-quality four-stage filtration system, which includes a pre-filter, HEPA filter, and an activated carbon filter. The unit is also equipped with PlasmaWave technology (optional), which helps break down the contaminants, making it easier for other filters to do their job. The 2-in-1 filter needs to be replaced once a year depending on the exploitation frequency. The replacement filter costs about $70. This air purifier is fairly quiet. The lowest out of four fan settings is about 33dB, which is great for sleeping. The highest fan setting is rather loud, but it doesn’t need to be used too often. The air purifier is packed with smart options, which you can use via a smartphone app. It’s equipped with a sensor, which evaluates the air quality and adjusts the fan settings accordingly. The purifier also has a sleep mode, during which the LED display is disabled and the fan works at its lowest setting. Overall, this is a high-quality air purifier, which I would recommend for anyone, who is looking for a smart device, which does a great job cleaning the air. It comes with a fair price tag. This air purifier is designed for small rooms of about 120 – 150 square feet. It has a reasonable price tag for such a small unit and a big number of perks, which I find convenient. It’s Wi-Fi enabled, so you can monitor the air quality and change the settings remotely. It has a 3-stage filtration system, which does a good job cleaning the air in the room of the recommended size. I appreciated the sleek look of this item. The black color and the tower built make it suitable for a variety of decors. The purifier isn’t heavy so you can move it around the house with ease. The LCD screen and the buttons on top are straightforward. So the operation is simple even if you don’t have a smartphone app. Judging from the CADR ratings, this air purifier can deal with rooms up to 150 square feet. This is a small room. Perhaps this purifier can be a good choice for an office cubicle. The purifier is equipped with a superb filtration system. Besides the carbon filter, it has a TrueHEPA filter to deal with the smallest contaminants. This model also features a UV-C light, which kills airborne germs. The air purifier is equipped with a sensor, which measures the air quality and adjusts the fan speed according to the readings. You can download an app and connect to the unit via Wi-Fi to learn the air quality in your home and change the settings, no matter how far away from the house you are. The air purifier may be somewhat loud at the highest fan setting but you will rarely need it. The low fan settings are quiet enough for the unit to be used in the bedroom. Overall, this is a high-quality air purifier suitable for small rooms. The Wi-Fi operation option is convenient. For an air purifier packed with smart features, this model has a surprisingly low price. However, the filter replacement costs are rather high while the coverage area is small. 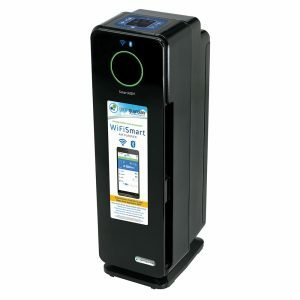 Wi-Fi-enabled air purifiers are highly convenient due to the ease of operation. Naturally they cost more than purifiers without smart options, however, they allow you to save on energy bills. Investing in a smart air purifier seems to be a good decision for a homeowner, who likes enjoying the benefits of new technologies. I would recommend trying one of these purifiers. Once you do, you may never settle for a simple air purifier again.